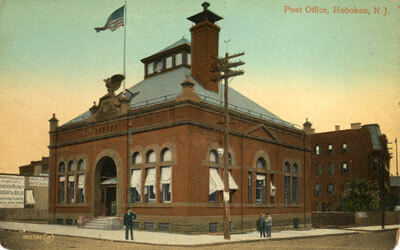 The Post Office is on the corner of Newark and River Streets. Keller: I could not find any Kellers in the 1900 or 1910 census who had anything to do with a restaurant. There were a number of Keller families in Hoboken at the time. 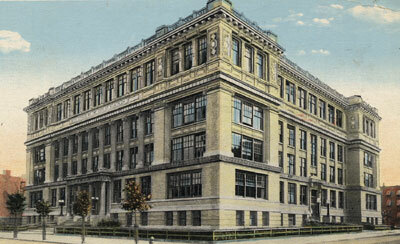 Post Office, Hoboken, N. J. 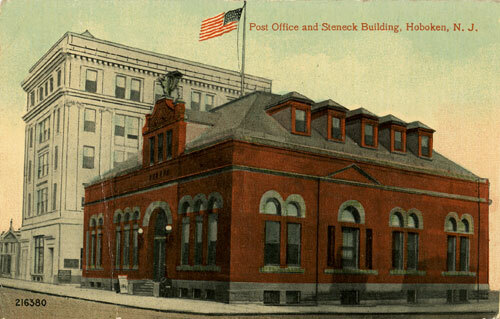 Post Office and Steneck Building, Hoboken, N. J. Notice, in addition to the Steneck building taking the place of the two short buildings in the previous photo, there are dormers on the post office building and an extra bay of windows has been added to the first floor. 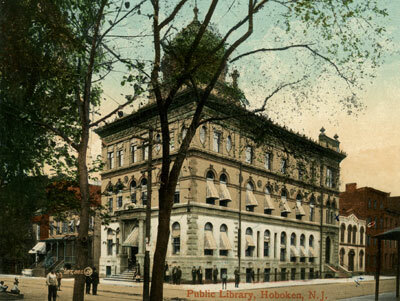 Hudson Trust Company, Hoboken, N. J. 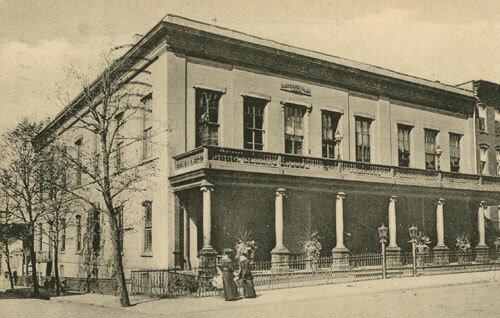 The Hudson Trust was on the corner of Newark and Hudson Streets. 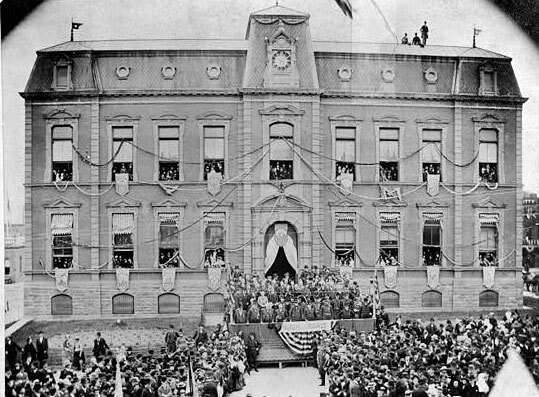 Celebration of August Grassman's city council victory 1880. August Grassman[n] was mayor of Hoboken from 1888 to 1891. He was born in Hamburg Germany March 9 1846. He immigrated on the Saxonia from Hamburg in February 1865. He was naturalized in Jersey City Common Pleas in 1880. He was 5 feet 8 inches tall with grey eyes and dark brown hair that by 1894 was tinged with grey. He was listed in the 1880 census as a grocer. By 1900 he was listed as an insurance salesman and in 1910 that was specifically listed as "fire insurance". He did not marry and was listed in 1900 and 1910 as lodging with Teresse Waldman (or Wallman) on Washington street. He died suddenly age 65 in 1911. August Grassmann, Groceries, Wines, Teas, Fruits, and Vegetables, No. 161 Washington Street. - One of the most popular among the well-known representative citizens and business men of Hoboken is Mr. August Grassmann, who during the past eleven years has been engaged in the grocery business. He is located at No. 161 Washington Street, at the corner of Fourth, where he has a fine, large, showy, attractive store, in which he keeps a choice, select assortment of family groceries, teas, coffees, and imported and domestic wines, also fruits, vegetables, hermetically sealed cans and glass, also condiments and every kind of table delicacies, and fresh fruits and vegetables in their season. Mr. Grassmann has one of the finest assortments of this class of goods to be found in the city, which has been carefully selected for a first- class custom. Mr. Grassmann is a German by birth, but has been in this country many years. He takes considerable interest in municipal affairs and is at present a member of Councils, serving on some of the most important committees. City Hall is on the corner of Newark Avenue and Washington Street. 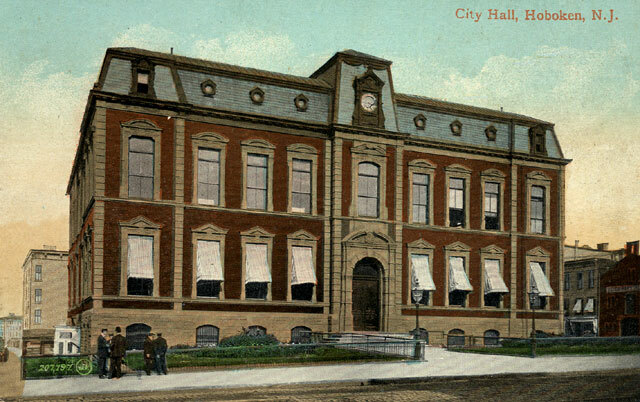 City Hall was completer in 1883 and enlarged in 1910/11. 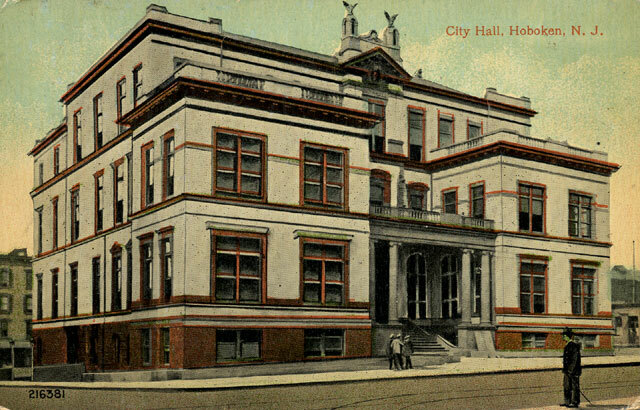 I assume since port of these post cards are labeled "City Hall, Hoboken, N.J.", that one predates 1910 and that the other is of the renovated City Hall. 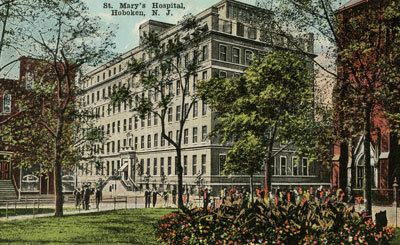 St Mary's Hospital was founded in 1863. 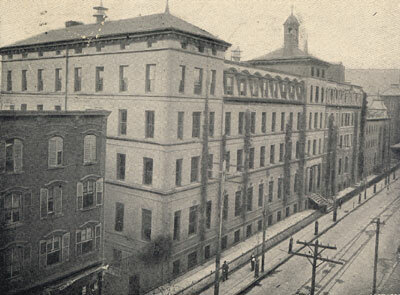 This photo taken from the corner of Church Square shows the hospital at 4th and Willow Street. 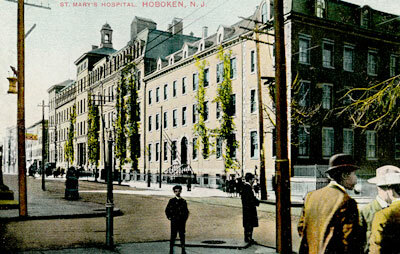 St Mary's Hospital, Hoboken, N. J. 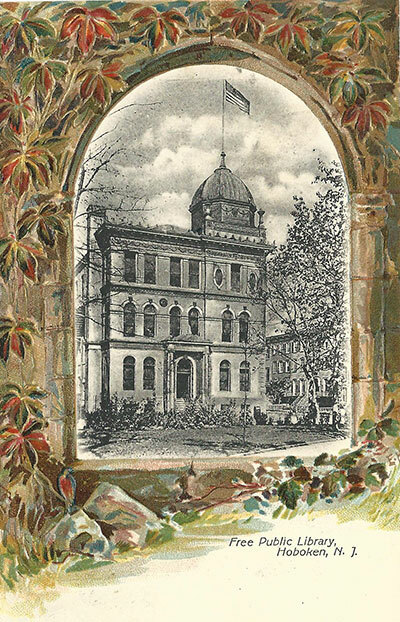 The library, build in 1897, is on 5th Street on the north side of Church Square Park. This card was sent in a post card exchange between Mr. H Ruberti of Cape Town, South Africa and Prof. Morris Loewy of Hoboken, N . J. Prof Loewy was a magician, card trick performer, stamp collector and post card exchange enthusiast. See Prof. Loewy. High School Hoboken, N. J. The High School was located at Park (formerly Meadow) and 6th Ave. on the North East corner behind the German Evangelical Church which can be seen in the right of the image. James Jacob Pierri, a Hoboken native, emailed in May 2008 to say the building was again being used as a school. 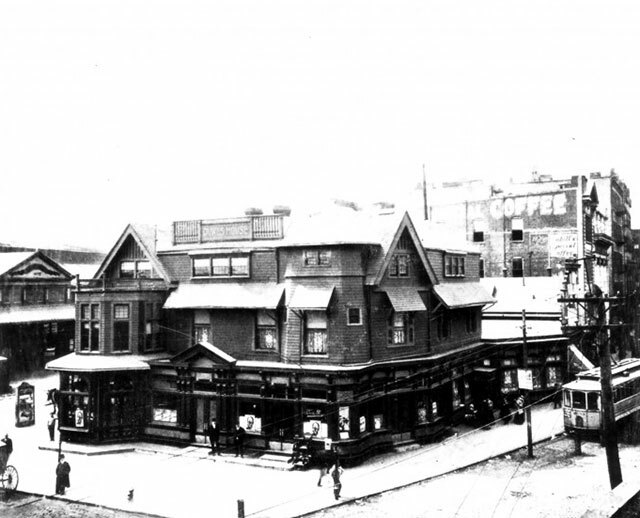 Garden Street and 4th Street circa 1918. In July 2012 Luz Perez wrote that the school was called A. J. Demarest High School. It was dedicated in 1911. It later became a junior high school. A. J. Demarest was the Superintendent of Public Instruction in Hoboken in 1905 when the following report was made regarding schools in Hoboken in 1903-1904. Public School No. 5, Hoboken, N. J. served the 100 block of Willow Street. Public School #5 built in 1877 at 122-132 Clinton Street (at second) was the third elementary built in Hoboken.The building still stands. According to the article in the Smithtown Newspaper, Meta Petermann Land and her sister and friends went to public school No. 1. This school was originally built on land left to the city by Edwin Augustus Stevens. It was a three story brick building heated by a pot belly stove in each classroom and lit by gas light. 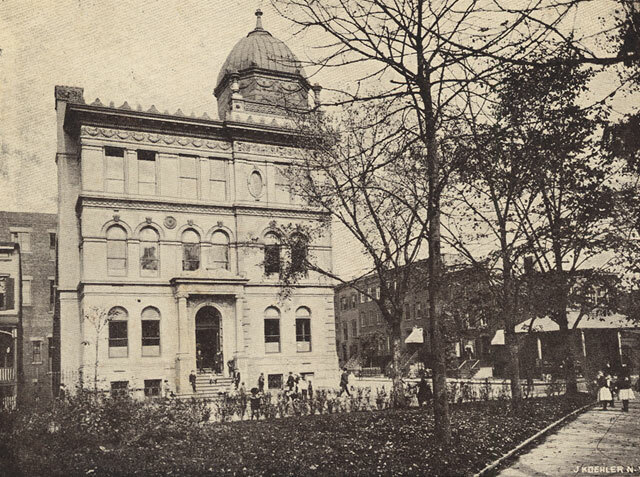 At times the school was very crowded and space was rented at the German Church on Garden Street below Second Street to accommodate the overflow of students. Sometimes there were as many as a hundred students to one class room. In 1866 Public School No 1 was located on Garden near 3rd. In 1884 David Rue was principle and Miss Leleke Allen was vice principle. 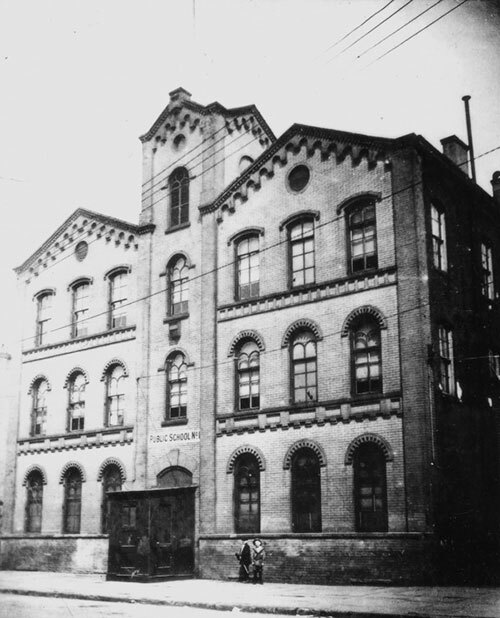 The school had a capacity of 825 studensts and the average attendance in 1883 was 782. 1901: David E Rue died in July 1901. He had long been a teacher at Public School No. 1 in Hoboken and was appointed principle of the school in 1869. He held that position until his death. He was born in Englishtown, N. J. in 1843. Educated at Lewisburg University (later Bucknell College) he fought in the Civil War with the Pennsylvania Volunteers. He was survived by a wife, two sons and a daughter. 1887: Quarter-century's progress of New Jersey's leading manufacturing centres. "In the important particular of school facilities Hoboken is abreast with her sister cities in the State. In addition to several private educational establishments there are four public schools, all of them model institutions of their kind, and supplied with all the modern appliances and facilities for imparting instruction in the higher branches of education. These schools are located as follows: No. 1, Garden street, near Third; No. 2, Garden street, near Tenth; No. 3, Adams street, near Second; No. 4, Park avenue, near Sixth. The schools are under the control of a Board of Education." 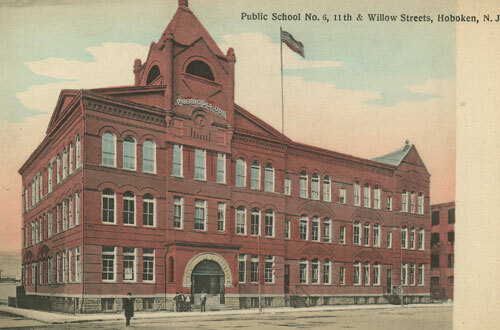 Starting in the early 1880s all school children, regardless of home language, studied German in the Hoboken public schools. Many Germans chose to live in Hoboken because German was taught in the public schools. The German language is taught in sixteen (16) classes, including the high school. The instruction is conducted under the management of a principal and one assistant teacher. It is intended that the study should be made as practical as possible, and with this end in view, a large part of the time is spent in conversation on topics beginning with those suggested by the school room. As a mercantile language the German in New York and vicinity has become well-nigh indispensable. 1918: In January 1918 the Board of Education ended the bilingual program in Hoboken's Public schools. Teaching of German was removed from the curriculum of the Hoboken public schools yesterday by a unanimous vote of the Board of Education, and for the first time in twenty-five years children in the grammar grades will not be required to study that language. High-school students may elect to study the language in the last two years of their course, but hereafter students will be compelled to study only English. 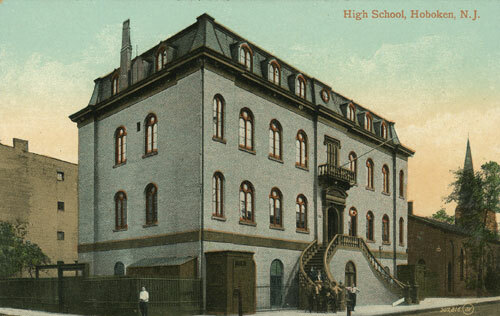 James T. Laverty, President of the Hoboken Board of Education, who submitted the resolution for the removal of the study of German, said that it was his idea to simplify the curriculum so that students might be graduated at an earlier age. He pointed out German as one of the subjects that might be dropped without disadvantage, and the Board of Education supported him. Members of Germanic descent also voted for the resolution. Most of the opposition to the compulsory study of German came from two district schools, where most of the students were Italians. They objected to the study of German, particularly after Italy entered the war, and open rebellion of classes has been reported to the Board of Education. When the study of German was made compulsory more than half of the students were of German descent. Now they are only about a fourth of the total number of pupils. Professor Otto Hoch, who has taught the language in the grammar school, has been transferred to the high-school department, where he will become director of a bureau of Americanization. He will instruct aliens of all nationalities in the drawing of naturalization papers, and tell them of the rights and privileges of American citizenship. In addition he will aid in the teaching of English. Public School No. 6, 11th and Willow, Hoboken, N. J. Public School #6 at the corner of Willow and 11th street was built in 1891. 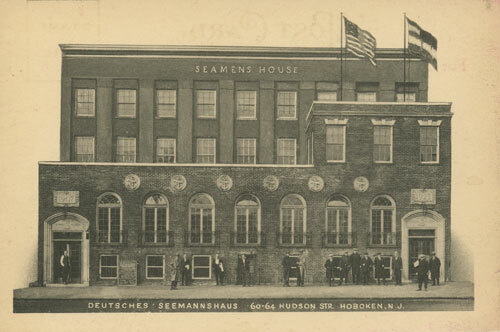 Deutsches Seemannshaus 60-64 Hudson Str, Hoboken, N. J.
Deutcher Club, Hoboken, N. J. On the Corner of 6th and Hudson. 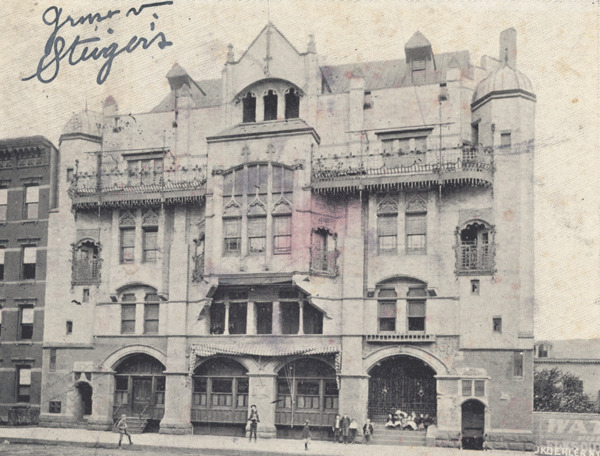 The name was changed during the first World War to the Union Club. It was a popular location for dances and political events. Frank Sinatra performed here in 1935 for $40 a week. No. 10 — The Quartette Club Hall, Hoboken, N. J. Later the Gayety Theater, 1200 Block Washington Street. The Quartette club was a lay singing society. Many promident German/American citizens of Hoboken were members of the Quartette Club. The German/America loved to sing and every city with a German/America community had singing societies who put on performances and who vied for prizes in competitions. 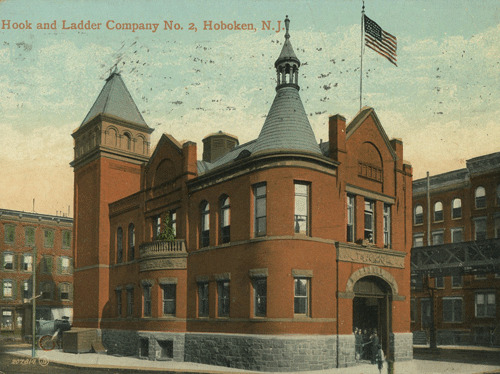 Hook and Ladder Company No 2 Hoboken, N.J.
Hof Brau House, Hoboken, N. J. 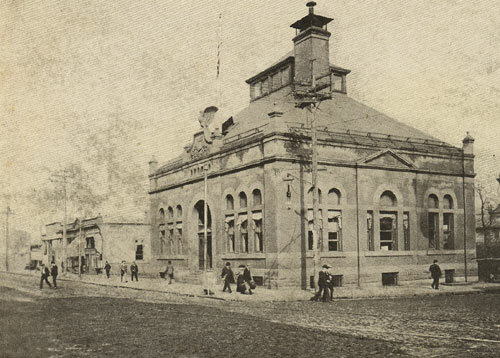 The Hof Brau House, know for its find German food, was at the corner of River and Second Streets. The Petermanns lived at one point at 36 2nd Street. Duke's House, Hoboken, N. J.
Duke's House owned by Martin Daab was a popular restaurant and bar on the pier near the train station. It had a reputation for fine food and service and catered to the likes of Lillian Russell, John L Sullivan and other prominent people of the times. It too was destroyed in the August 7 pier fire. A 1916/17 New Year's Holiday dinner offered: fresh fruit cocktail, clear ox tail soup, stuffed deviled crabs, squab chicken polonaise, julienne potatoes, peas etuvees, hearts of romaine with Russian dressing, fancy ice cream friandise, and cafe. 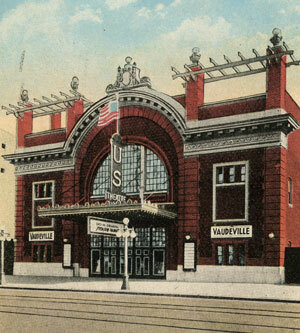 See also Train Station and the 1905 Fire for images of the building after in burned. The Duke's house got its name from the one time manger of the restaurant, Louis Duke of Calabritta who was born in Naples in 1818 and died in Hoboken in 1886. "The Duke of Calabritto has died in Hoboken of pneumonia in his sixty-ninth year. He was a real duke descended form a long line of titled ancestors and he inherited a large estate in his native Italy, but participation in the revolution of '48 resulted in his banishment. His wife refused to come to this country with him and remained in Europe with their sons, thus causing permanent separation. The Duke was widely esteemed as the manager of the old Napoleon Hotel near the ferry in Hoboken, known in later years as the duke's House." Another obit of the Duke stated the Duke was the manager of "the old Hoboken House which stood where the depot of the Delaware, Lackawanna, & Western Rail road stands now. It was a famous house of its time, but was town down twenty years ago. Then the Duke became manager of the Hotel Napoleon, which stood a the corner of Washington and First Streets." The Napoleon was torn down in 1870. The notice of the Dukes death was carried in many papers across the US. The Dukes House was described as "neat but unpretentious three story building, mostly constructed of tiles, the greater portion of the lower part being glass". 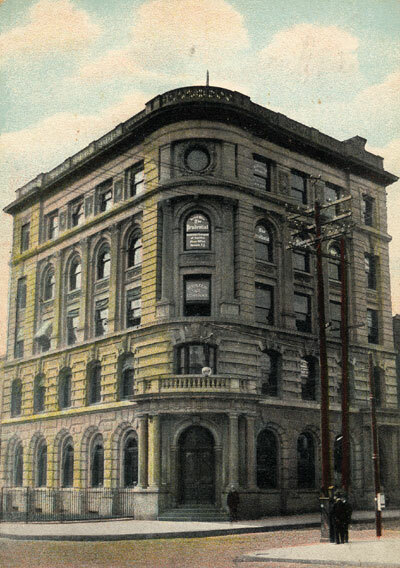 The building burned down in the 1905 Hoboken fire.